Inspired by local myths and bogey man stories, and fuelled by US horror comics, an urban legend is born – The Gorbals Vampire. There are “two wee empty chairs” at the back of a Gorbals’ primary school class, Chinese whispers in the playground escalate into full-blown hysteria as the “creative thinking” kids debate the fate of their two school pals. Night after night until the sun goes down, the pint-sized vigilantes return to hunt their man, and only the rain and the intervention of local headmasters puts an end to the marauder’s madness. What would have been consigned to the local archives gained worldwide media coverage and a backlash against the American horror comics that were gaining popularity in the country. This mass indignation also spawned the 1955 Children and Young Persons (Harmful Publications) Act, laws still in force today. National treasure in the making, Johnny McKnight has not only created a work filled with humour, it is also a work cleverly and subtly interwoven with a social commentary on tenement life in Glasgow in the fifties – the overcrowding, neglect and social injustice, how this section of the city was unloved and unlistened to. This was the hardest part of town, and in the eyes of the police, if they were cowering indoors frightened of a 7-foot vampire then they weren’t on the streets bothering them. The community cast of over 50 players makes the stage throb with life against the brilliant set design of Neil Haynes and the wonderfully atmospheric lighting of Stuart Jenkins, all enhanced by Kim Beveridge’s subtle but highly effective video projections – you can almost feel the metal tang in the air from Dixon Blazes. This is a glorious celebration of Glasgow and what it means to be Glaswegian – when the chips are down, the community pulls together as one, the city’s divisions are forgotten and the people unite in a common cause. A real gem of a production. It’s been 20 years since Keythe Farley, Brian Flemming and Laurence O’Keefe’s Batboy first graced the stage (making it older than the entire cast of this Dance School of Scotland production). This musical theatre cult oddity is based on a 1992 Weekly World News schlock-horror story of a half-boy, half-bat found in a cave in West Virginia. Expanding the story into themes of prejudice and acceptance, Edgar, as the titular batboy is re-Christened, is humanised by the family of the local vet, learns to speak in the finest RP English and is eventually introduced to the townsfolk. But, as with all the best B-movies, this happy acceptance doesn’t last. When a spate of cattle killings coincide with Edgar’s appearance it doesn’t take long for the townsfolk to turn. In classic B-movie style there’s every cliché about small town America here, right down to the flaming torch-wielding lynch mob. With its tongue planted firmly in its cheek, this production, under the direction of Graham Dickie, manages to tread the fine line between sacrificing quality for cheap laughs and the acting remains on-point throughout. There ain’t no stage-school bad habits here. This is young talent at its finest, under tight direction. What the cast lack in years, they more than made up for in ability. Matthew Wilson is a supremely talented young actor, as Batboy, his beautifully toned voice is an absolute treat for the ears, standout too is Kathryn Ronney (Mrs Parker) an actress with more talent and poise than many professionals decades older – this central pair should be assured of a bright future. That’s not to say they are the only highlights, both are more than ably supported by Samuel Stevenson as Dr Parker and Keir Ogilvy as revivalist minister Rev. Hightower, two young men who shine, as do the fine-sounding ensemble. Mention must be made of the scenic design and staging which are as sublime as the acting, putting many national touring productions to shame with their quality and originality. This production is visually stunning and grabs the attention throughout. Always an utter pleasure to watch, the Dance School of Scotland deliver sheer class and quality yet again. Last weekend GTB went on a field trip behind the scenes at the historic Citizens Theatre. The Citizens’ Company, founded in 1943 by Tom Honeyman, James Bridie and Paul Vincent Carroll, was based at first in the Glasgow Athenaeum (now the Conservatoire) moving in 1945 to its present site, then the Royal Princess’s Theatre (below, opened 1878), to become what we now know and love as the Citizens Theatre. As atmospheric and captivating backstage as it is onstage, here are some pictures from the informative tour. The tour includes tea and cake if any incentive were needed! An Iraqi cardiac specialist, a teen on a zero hours contract at Sports Direct, a Tory ex-councillor, an unemployed graduate, an ex-con and a struggling single mum are among the 12 people who come together in a community centre in Wishaw, North Lanarkshire, in Paul Higgins and Ricky Ross’ new musical The Choir, a collaboration between theatrical giants ATG and the Citizens Theatre to nurture new musical theatre from local writers and composers. There’s no competition, no race to a prize. Instead, the drama comes from the interactions between this disparate chorus. The seemingly uplifting subject matter is initially turned on its head when instead of the sense of community and togetherness they hope to invoke by their shared love of singing, the sociological and political differences between the group rear their ugly heads. Those who exercise free will provoke those with conventional sensibilities and seemingly simple things offend and outrage. It all gets off to a spine-tingling start as Peter Polycarpou’s Khalid steps centre stage to sing the first of a series of intensely personal songs and the cast as a whole doesn’t disappoint. Glorious sounding en masse, there isn’t a weak link among them and, while it seems churlish to single any out, it is undoubtedly Ryan Fletcher as ex-con Donny and Scott Reid as little cousin Scott, who shine. Fletcher, in particular, is a stand-out, in possession of a glorious voice and a prodigious musical talent, it is for him you root for a happy ending. Eschewing the musical theatre convention of bursting into song at will, here the songs arise naturally and realistically from the narrative and are entirely pleasing to the ear, partly due to the seeming familiarity of some of the melodies, with shades of Oasis, The Beach Boys and The Beatles to name a few. If criticism is to be made it’s that the characterisations are thin in some cases and points are hammered home at times with little subtlety, but the actors’ deft touches manage to imbue it all with real heart and soul and you can’t help caring for them all and willing the whole thing to a happy conclusion. 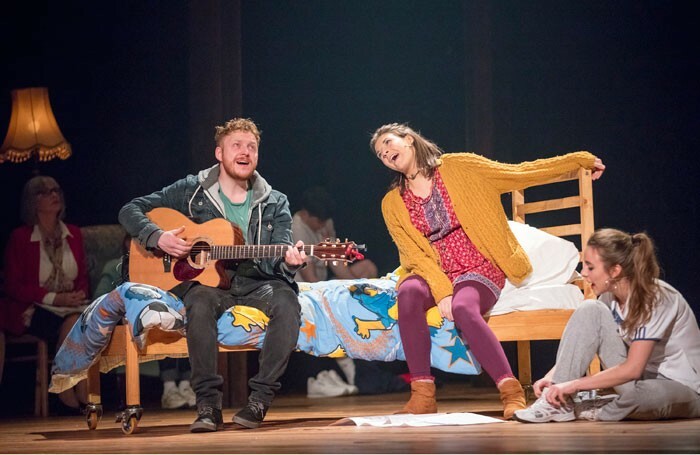 It’s not exactly groundbreaking (it has at times the same feel and tone as Glen Hansard’s Once), but it has to be applauded for bringing something new to the musical theatre stage, not a film or novel adaptation, not a jukebox musical, instead an original story and songs with entirely relatable subject matter. As an evening’s entertainment, it may not be perfect but it comes pretty damn close – on the whole it is a thoroughly engaging and utterly irresistible evening’s theatre. The Choir is guaranteed to send you into the crisp autumn air with the cockles of your heart well and truly warmed. A knock-out cast, some fabulous, familiar tunes and a clear direction proves there’s life in the old dog yet in the Dance School of Scotland’s production of Godspell. Always a tricky beast, John-Michael Tebelak and Stephen Schwartz’s trippy-hippy treatment of the gospels of St. Matthew and St. Luke) has proved problematic in the past, however, here under the steady hand of director Graham Dickie, a clear narrative emerges amongst the disparate parables. The Dance School of Scotland provide the creme de la creme of musical theatre students in the country and this year’s batch are no exception. Chief among them Ryan Kopel and Aaron Millar, two young men in possession of stunning and very different voices who will doubtless grace the stages of the West End and beyond in years to come. Kopel’s solo rendition of the classic “Beautiful City” is among the best I’ve ever heard. This is a fitting showcase for the best of young Scottish musical theatre and a must-see in the theatrical calendar. I personally can’t wait until next year. Headlong, Sheffield Theatres and Rose Theatre Kingston bring their new production of David Hare’s The Absence of War, directed by Headlong Artistic Director Jeremy Herrin, to the Citizens Theatre from 31 March – 4 April. This new staging of Hare’s funny, stinging political drama focusing on the fortunes of the Labour Party arrives at the Citizens Theatre in the build up to the 2015 general election. It’s now or never for George Jones. The heavy-smoking, Shakespeare-loving Labour leader needs to get out of opposition and into Number Ten. Plagued by a hostile media, beset by divisions in his party and haunted by his own demons, George has three weeks to convince the Great British Public that he’s their man. But how much compromise is he prepared to make? How can you truly appeal to the man in the street from the Palace of Westminster? And which tie should he wear for Prime Minister’s Questions? The cast is led by Reece Dinsdale as George Jones, whose film appearances include Guildenstern in Kenneth Branagh’s Hamlet. His TV appearances include Joe McIntyre in Coronation Street and guest roles in Spooks, Life on Mars, Silent Witness and Waterloo Road amongst others. Also in the cast is Gorbals-born young actor James Harkness. James is returning to the Citizens Theatre having been a member of the Citizens Young Co. from 2007 – 2009. James performed with Citizens Young Co. as part of the Theatre of Debate season at National Theatre’s New Connections Festival in 2008. It was during this performance that James was spotted by Anthony Banks, Associate Director NT Learning who offered to mentor James in his preparation for his auditions for drama school. Through this connection with the National Theatre, an anonymous donor came forward and offered to support James financially throughout the duration of his training. David Hare is one of the UK’s foremost playwrights and screenwriters. His plays include Plenty, Skylight, The Permanent Way and Stuff Happens. He has received two Academy Award nominations for his screenplays for The Hours and The Reader. The production marks the third collaboration between Hare and Headlong’s Artistic Director Jeremy Herrin, winner of the Evening Standard Theatre Award for Best Director for Wolf Hall and Bring up the Bodies, and director of the company’s most recent transfer to London’s West End, The Nether. Headlong is a regular visitor to the Gorbals theatre, most recently bringing its West End smash-hit version of George Orwell’s 1984 to Glasgow audiences. Previous productions at the Citizens Theatre include Chekov’s The Seagull, Medea, Edward Gant’s Amazing Feats of Loneliness and A Midsummer Night’s Dream. The Absence of War opened in Sheffield on Friday 6 February and tours to Norwich, Watford, Bristol, Cheltenham, Liverpool, before arriving at the Citizens Theatre. The Absence of War also tours to Oxford, Kingston, Cambridge and ends at Theatre Royal Bath on 9 May. 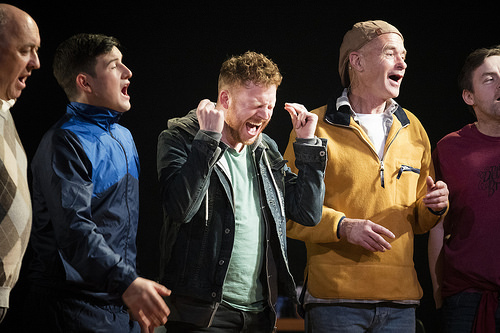 There will be few productions in Scotland this year that will be met with more anticipation than the Citizens Theatre revival of John Byrne’s seminal work The Slab Boys. 37 years on from its debut at the Traverse in Edinburgh, original director David Hayman and creator John Byrne reunite to celebrate the Citz 70th year. Mythologised as the play that inspired an entire generation of Scottish writers and performers, the question is: does it stand up to its reputation and regard? It’s 1957, a typical Friday in a Paisley carpet factory, despite the slate grey surroundings, the seeds of teenage rebellion fester under posters of James Dean and Elvis: “Slab Boys” Phil (Sammy Hayman) and Spanky (Jamie Quinn) rail against both the establishment and circumstance, yearning for a life outside the confines of the “slab room”where their days are spent mixing paint. Whilst Phil dreams of entrance into art school, Spanky wants to make it to a desk in the design room, but the pair’s energies seem to be wholly invested in relentlessly tormenting any and all visitors to their domain, especially their fellow “slab boy” Hector (Scott Fletcher). Fans will be happy to know that the play retains much of its original allure: Byrne’s brilliantly observed dialogue comes across as razor sharp as it always has, and the work remains one of the finest examples of ensemble theatre. The audience still laughs at the cruelty of Spanky and Phil, but it must be said, in these days of political correctness, there are points where you are left wondering whether to laugh or squirm in discomfort at the relentless torment, even talk of Phil’s mother’s mental illness is delivered with a barrage of cruel barbs. But however brutal the ribbing gets, there is an understanding that it is very much a defence and when the chips are down the pair still have enough heart to rally to the aid of the unfortunate Hector. There are a brace of fine performances here: director Hayman delivers a sure-footed turn as bombastic factory manager Willie Currie; Jamie Quinn’s Spanky has all the swagger of the typical west of Scotland wide-boy and Kieran Baker’s middle class Alan, is a perfectly pitched foil for the coarse central duo; Scott Fletcher too, is irresistible (not to mention hysterical) as the naive Hector. However, less successful is Sammy Hayman’s Phil: whether it’s nerves, inexperience, bad diction or miscasting, Hayman Jr’s dialogue, delivered at machine gun fire pace, is often lost into the ether, and while he perfectly captures the brutality and callousness of Phil, he fails to bring the required charm that elevates the role to one of the best in Scottish theatre. David Hayman’s production is sure-footed but one gripe would be the length of the piece, it would benefit from judicious trimming to make it even tighter, the inevitable climax is a little long in coming, but that said it remains unfailingly entertaining throughout. A solid and satisfying production with plenty of laugh-out loud humour, but lacking that certain something that makes for brilliance. Arriving in Glasgow on a wave of five-star reviews, Headlong’s sell-out production of 1984 at the Citizens Theatre would seem to promise much, but the question is, does it deliver? The answer, thankfully, is a resounding yes. Theatrical productions that genuinely have the power to move are becoming fewer and farther between, but Robert Icke and Duncan Macmillan’s new adaptation of George Orwell’s dystopian masterpiece certainly packs an emotional punch. Taking as its source material the Appendix of the original novel, this is the first attempt to dramatise the often missed or disregarded part of the novel in any medium. Despite living in a world where the general public expects, if not agrees with being routinely watched and in light of the revelations of Edward Snowden and Julian Assange, the story still has the power to shock, and its resonance cannot go unnoticed; the times of financial austerity and political disenchantment in which Orwell’s masterpiece was written are startlingly familiar to audiences today. This is a production of subtle and infinite detail. The inventive and evocative staging is the perfect marriage of set, lighting and sound design and the transformation to Room 101 is particularly skilfully and chillingly achieved. The cast deliver performances universally deserving of praise, remaining utterly convincing and perfectly pitched throughout. The genius of Orwell’s writing remains undiminished in the hands of Headlong in this sublime production. Universally acknowledged as a showcase for Scottish musical theatre stars of the future, The Dance School of Scotland’s 2014 show Betty Blue Eyes doesn’t disappoint. Based upon Alan Bennett’s screenplay for the 1984 film A Private Function, Ron Cowen, Daniel Lipman and composing team Stiles and Drewe’s musical tells the tale of Austerity Britain. It’s 1947 and rationing is still in place two years after the war has ended. Fed up with eating Spam, some less than scrupulous Yorkshire business men decide to secretly raise an unlicensed pig to feast upon at the town’s celebration of the wedding of Princess Elizabeth and Phillip Mountbatten. But into the mix comes mild-mannered chiropodist Gilbert Chilvers, his ambitious wife Joyce and Ministry of Food inspector Wormold and the best laid plans of the town’s great and good don’t quite go to plan. The cast are, as usual, a knockout, in particular Mari McGinlay as Joyce, in possession of a stand-out voice, a pitch perfect accent and a finely nuanced acting performance, this is a young woman who, to all intents and purposes, is ready and set for the West End right now. As last year, Ryan Hunter turns in a magnetic performance as Dr. Swaby, he is a young man of immense talent and charisma which belie his years. Both can look forward to sparkling careers ahead. The ensemble are universally deserving of praise – maintaining focus and sharpness throughout as well as producing a full and rich sounding chorus. The set is simple but effective and high praise must go to the puppet team who successfully bring Betty the pig to life. As someone who saw the 6 figure animatronic version in the West End it was with great interest I awaited Betty’s appearance – I’m happy to say she doesn’t disappoint. Where the whole endeavour falls down (and indeed the reason for its short West End run) is not the actors or the set or the direction but with the piece itself. Though there are highlights throughout, it is missing that elusive sparkle that makes a show a hit and it ends on a bit of a damp squib. That said, it doesn’t detract from the first-rate performances of the young cast. I look forward to following their future careers. “Ladies, an announcement: I am up for it, all the time”. With an opener like that the only way to go was up. A work of infinite quality; a masterclass in writing and direction with a blistering central performance from Martin Hutson. Mesmeric, mercurial and meteoric. Unmissable.